One of the awesome things this city has to offer is the availability of author signings at every turn. I’ve gone to two so far – Tina Fey for “Bossypants” and Charlaine Harris for book 11 in the Sookie Stackhouse novels, “Dead Reckoning,” both at the Union Square Barnes & Noble. 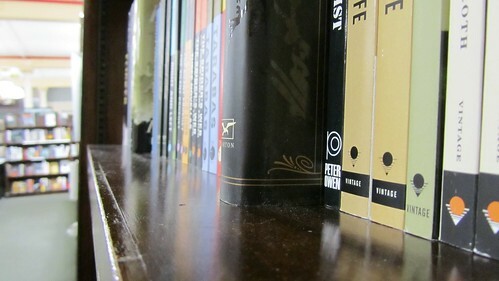 When we first arrived in New York I started noticing the author signing posters in every bookstore window, it seemed like in Austin there was one game in town – Book People. Yes authors went to other stores but they didn’t necessarily all come to Austin & when superstars did come to town the spaces were so limited that you were literally outside hoping they wouldn’t cut off the line before you wormed your way up the stairs book in hand. Often they chose only one large city in Texas but not always Austin whereas it seems like they all come here. hundreds of people away from Tina Fey.... thinking of reading something else now. I perused a Star Wars cook book and stretched my legs up and down a few other aisles. As soon as I heard that Charlaine Harris would be at B&N in union square I knew I absolutely had to go. After the overwhelmingly large crowd that showed up for our first book signing (Tina Fey, “Bossypants”) and his overall lack of interest in this particular author and her novels, Paul opted not to attend the event with me. At least when we stood in what should have been a line but was rather just a giant crowd corralled by security and store staff into the stacks and behind columns for Tina Fey, I had him to make idle conversation with. 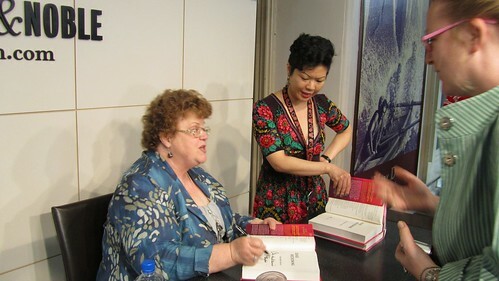 Luckily for me Charlaine’s event wasn’t as wildly attended but those of us that were there were ridiculously avid fans. I was super excited and a little giddy when they led me to a seat in the 8th row. I spent my time sandwiched between a couple from New Zealand (I think) and an awesome woman from Sidney, Australia. When Charlaine finally arrived I noticed that the seating area was completely taken and there were some people standing so the crowd filled out quite well. 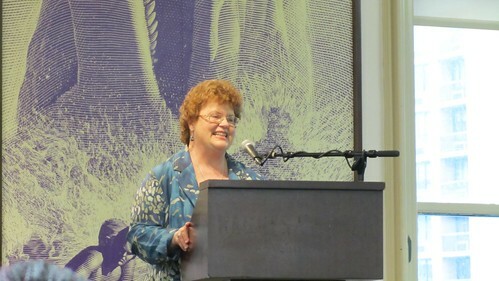 Charlaine said a few words then opened the room up to a general Q&A which immediately led to anxious hands in the air. I was struck by how ridiculously normal she was and how funny she was. I read these books of hers and I see her photo on the book flap and yes sometimes I read her blog where she reviews books and covers tidbits from her life including the dogs, packing, and her daughter now in college, but all that is very disarming and although I know she writes these books I don’t really understand how these stories come from her. But her in person, personality and sense of humor and comic timing as well as her expressiveness, I think, was really what we wanted as readers to see and hear. When it was my turn I froze up and thanked her for coming out and I introduced myself – I don’t really know why she would care that my name is Clarissa but she was really sweet about it and said it was “duly noted” and she’d “be keeping my eye on you now.” Anyway, since it was already established that she would write two more Sookie books and that she had the ending settled in her head I asked about the rest. Is there a general outline/storyboard/etc for these last two books or is it just the end? She said that actually she only had the very end worked out and that anything could still happen from now until then and that of course no one was safe, she likes to throw a wrench in a situation. A B&N staffer who seemed to be running the Tina Fey show was also running the Charlaine Harris show which worried me. At Tina’s signing she was nice enough before the talk as she gave instructions to the crowd but once we were finally lined up, she & the security were really aggressive about taking photos from the line. Photos were ok from any other distance except once you were actually close to her & they made great efforts to hustle the line through. They said they didn’t want to slow the line down but it clearly wasn’t slowing anything down and for Charlaine there wasn’t nearly the aggressiveness. I now wonder if it was actually a Tina Fey policy rather than a store policy? There wasn’t really any idle chit-chat with the author who had 2 assistants flanking her and expediting the line. Granted for Tina Fey there were 800-1000 people in the store and she was 5 months pregnant and we all really wanted our books signed and none of us were leaving early so she could get some rest and she never took a single break to stretch her legs or otherwise but they were pretty aggressive. 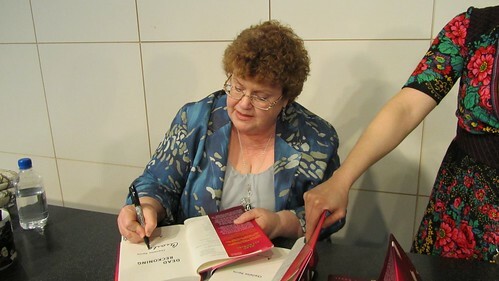 Charlaine Harris - signing my books! I kept one and gave the other a surprise to the person that introduced me to the Sookie Stackhouse series. For Charlaine, Bossy B&N staffer told us that she’d only be signing her name (no personalization – same as the Fey event) and she’d only be signing copies of the book she was on tour with (none of her other books), but then she said we were welcome to snap all the pics we wanted but that Charlaine wouldn’t have the time to pose with us so we’d have to get them however we could. Then, I saw someone holding an older book and I was sure this was where Bossy B&N was going to let him have it! But instead she discretely held the book under the table, opened it to the title page, and slid it in front of Charlaine to sign! Another clue that maybe it was really Tina & her people who required the strict policy at her event. During the Harris Q&A Bossy B&N seemed interested in the responses and nodded her head at good questions and then in the line I noticed that she was asking Charlaine more pointed questions and making references to her work which lead me to believe she was a fan too. Charlaine Harris - interacting with her readers! Despite the hustle attitude I did get a tiny moment with Tina Fey. When her assistant took my book from me the receipt slipped out of it. She apologized and handed it back to me and as I took it from her I made a silly expression and said “in case I want to return it, thank you!” which somehow elicited a giggle from Tina herself. She responded with her own little quip and then it was over. My book was back in my hands and the security were pointing in the direction of the exit – my new best friend and her staff continued signing books and I went for a late night dinner and drinks. After Tina Fey's Q&A we were instructed to line up along the perimeter of the store. I was by far not in the back of the line but I was also certainly no where hear the front either. 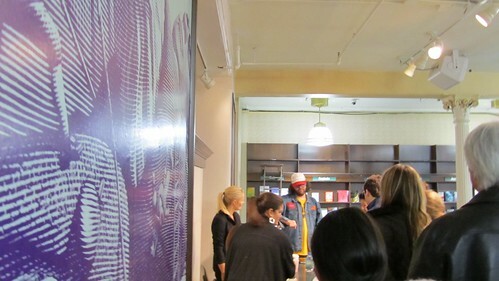 The line actually snaked through some of the stacks and many people actually "saw" her talk from behind stacks. Once it was my turn with Charlaine, I realized that we all got to share a few sentences with her and no one shooed us away, I just thanked her for coming out here and probably giggled like a school girl – who really knows at this point, I was completely unprepared for the opportunity to exchange words but I did suggest she consider Austin for future tours because she’d never visited during my 7 years there. She wondered aloud why she’d never been to Austin and I told her likely because it was too hot and she laughed and reminded me that she had been to Houston – which proves my earlier point. Bossy B&N insisted Texas wasn’t too hot and smiled as she passed the next set of books across the table to be signed. My moment was again over. My newest new best friend likely had a totally different best friend who I like to call Bossy B&N who wasn’t really so bossy after all. This photo got me yelled at (or spoken to sternly) by security. All I got were Tina Fey's assistants, the line, and Judah Friedlander. Oh if you look really closely you can see the back of her head. ok, i suppose that's cool too. 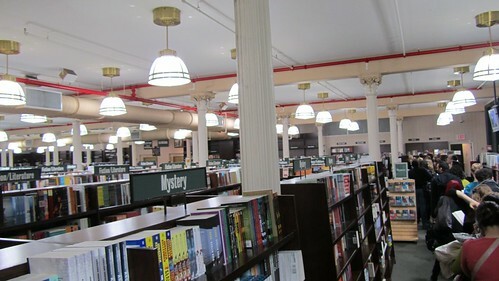 This entry was posted in events, everything i've blogged and tagged Author, Barnes & Noble, Book signing, books, Charlaine Harris, events, Firsts, Judah Friedlander, New York City, Sookie Stackhouse, Tina Fey, Union Square. Bookmark the permalink.